The Harry Ransom Center and the University of Reading have worked together for the past 20 years to establish and maintain the WATCH File, now one of the largest worldwide resources on copyright information. To commemorate the 20th anniversary, Rick Watson, current U.S. compiler for WATCH, and Andrew Gansky, a graduate intern at the Ransom Center, interviewed founders Cathy Henderson and David Sutton and invited them to reflect on their experiences building and running an online international copyright resource, to share their perspectives on the changing landscape of copyright policy, and to comment on what the future might hold for WATCH. What was the original impetus for WATCH? WATCH came into being in mid-1994 as a response to the revision of national laws (following the principles of the Berne Convention, an international agreement governing copyright) to favor the intellectual property rights of creators, making copyright protection automatic at the moment of creation. This shift in law set up an environment in which those who wanted to make use of those creations might more frequently need to obtain express permission to do so. WATCH is now the world’s primary source of information about who holds the copyright in any individual’s creative works. The acronym originally stood for Writers and Their Copyright Holders, and it was upgraded in 1997 to include artists. How did WATCH develop as a web resource? WATCH was initially launched as a pre-web online gopher file. With the rapid development of the World Wide Web, by 1996 WATCH had become one of the earliest public information websites, and probably one of the first to be a joint U.S.-U.K. project. The web address has changed over the years but has always been reachable through the helpful alias of www.watch-file.com. The starting-points for the WATCH research were informal (often handwritten) sources in the major research libraries. The Harry Ransom Center had records of the copyright holders of up to 1,000 authors, mostly literary and mostly British, and by late 1994 they had obtained written permissions to include details on more than 700 of these copyright holders in the database. Other early contributors included the British Library, the Bodleian Library, the National Library of Wales, the University of Delaware Library, and the Huntington Library. While the project had archival and literary origins (a first-name list of authors to be included was provided by a Reading-based parent project called the Location Register of English Literary Manuscripts and Letters), a principle was established very early on of never refusing to include copyright information provided to the WATCH offices, even if it was not very literary, not very archival, or not very British or American. As a result, the WATCH file now contains well over 20,000 records covering creators from about a hundred different countries. What were the challenges with WATCH as it developed, whether technological, institutional support, or copyright holder participation? The British end of the project was enthusiastically supported by the Society of Authors and the British Library and attracted funding from the Strachey Trust, the Arts Council, the Royal Literary Fund, the British Academy, and a number of private charities, including the Pilgrim Trust, the Chase Charity, and the Esmée Fairbairn Foundation. On the U.S. side, Ransom Center reference staff contribute content, while the Center’s IT staff has ably migrated the database content across a succession of platforms and currently maintains the website and underlying data infrastructure. What has it been like maintaining WATCH as a joint U.K.-U.S. enterprise, especially in terms of differing copyright regulations and contexts between countries? A division of labor was established relatively early on. The Reading WATCH office locates copyright holders for U.K. and European-born writers and artists while the Ransom Center WATCH office focuses primarily on U.S. and North American–born ones. When and why did the need for a different database for literary organizations and publishing houses become apparent? Publishing and literary organizations—publishing houses, literary agencies, and little magazines—that have gone out of business and disappeared from view are notoriously difficult to track. 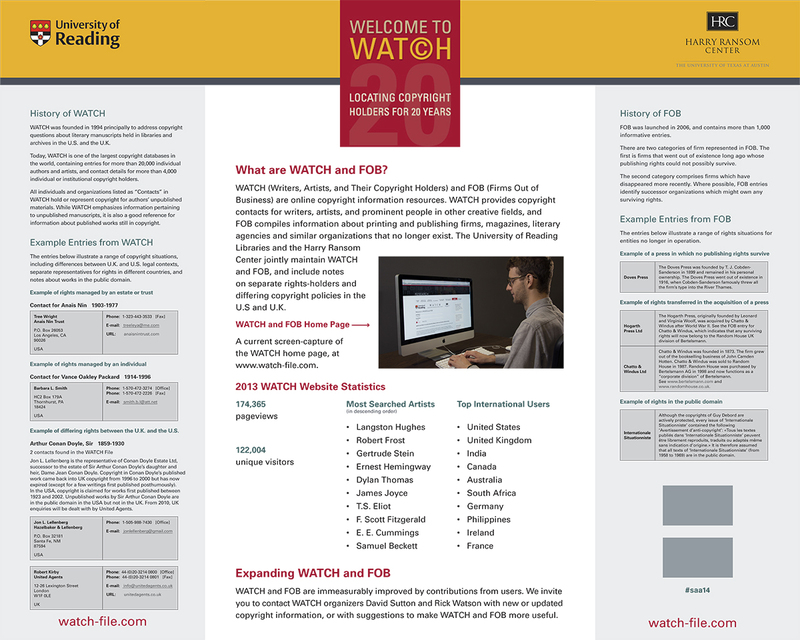 The two WATCH teams began work on creating an addition to WATCH, which has been named FOB (Firms Out of Business) in 2006. This is a separate file accessible from the WATCH home page that will grow as information is researched in both Reading and Texas. New content for FOB is welcome from anyone conducting research in this particular field of study. Do you foresee any particular challenges for WATCH and FOB in the future as technologies and copyright practices continue to evolve? With regard to WATCH, we are monitoring whether or not the U.S. Copyright Office and copyright regulating authorities in other countries heed a call for a reintroduction of national copyright registries. Should that happen, then the need for the WATCH file may diminish. Indeed, the WATCH file might even be absorbed by one or more such registries. The utility of FOB, however, is likely only to grow as the business model for traditional print publishers continues to shift dramatically, resulting in mergers and firms going out of business. Any particular goals for growing or expanding WATCH and FOB? The universities of Texas and Reading are fully committed to maintaining WATCH and supporting both the expansion of its international role and its participation in new and related areas of research. One of the greatest challenges is to secure continuing external funding beyond the annual support of the Strachey Trust and the British Academy so that more resources can be directed to the kind of purposeful and sometimes in-depth research required to enhance and update the WATCH and FOB files. Finally, I am sure we would all like to hear any especially interesting copyright stories. Any surprises in 20 years, or stories that illustrate the relationship between WATCH, copyright holders listed in, or scholars who use the database? The WATCH offices have received some very strange letters and emails over the years, including several from authors enquiring about the whereabouts of their own copyrights, requests for copyright information about nursery rhymes and stories like “Three little pigs,” and one letter from an author who had died some months earlier. (It transpired that the letter had been found in his desk after his death, and his executors had decided to post it, in view of its positive comments about WATCH and request to be included: a posthumous plaudit.) WATCH was even once contacted by a private investigator hired to track down the owner of an obscure author’s copyrights. As an annoyance and a curiosity, the duration of copyright in manuscript materials in the U.K. is a constant source of surprise. Every year the U.K. WATCH Office refers authors seeking to clear copyright for Charles Dickens (who died in 1870) to Commander Mark Dickens, and for Lord Byron (who died in 1824) to Messrs John Murray.